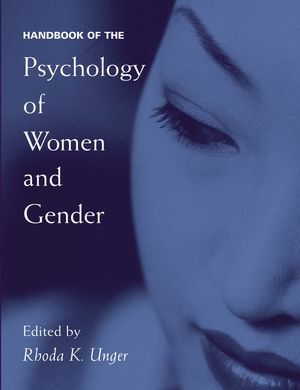 Edited by Rhoda Unger, a pioneer in feminist psychology, this handbook provides an extraordinarily balanced, in-depth treatment of major contemporary theories, trends, and advances in the field of women and gender. Bringing together contributions from leading U.S. and international scholars, it presents integrated coverage of a variety of approaches-ranging from traditional experiments to postmodern analyses. Conceptual models discussed include those that look within the individual, between individuals and groups, and beyond the person-to the social-structural frameworks in which people are embedded as well as biological and evolutionary perspectives. Multicultural and cross-cultural issues are emphasized throughout, including key variables such as sexual orientation, race/ethnicity, and social class. Researchers and clinicians alike will appreciate the thorough review of the latest thinking about gender and its impact on physical and mental health-which includes the emerging trends in feminist therapy and sociocultural issues important in the treatment of women of color. In addressing developmental issues, the book offers thought-provoking discussions of new research into possible biological influences on gender-specific behaviors; the role of early conditioning by parents, school, and the media; the role of mother and mothering; gender in old age; and more. Power and gender, as well as the latest research findings on American men's ambivalence toward women, sexual harassment, and violence against women, are among the timely topics explored in viewing gender as a systemic phenomenon. Handbook of the Psychology of Women and Gender is must reading for mental health researchers and practitioners, as well as scholars in a variety of disciplines who want to stay current with the latest psychological/psychosocial thinking on women and gender. Rhoda K. Unger received her PhD in experimental psychology from Harvard University. She has authored or edited eight books and more than sixty journal articles and book chapters in the field of the psychology of women and gender. 9. Adolescent Girls' Voices: Resonating Resistance in Body and Soul (D. Tolman and L. Brown). 10. Current Perspectives on Women's Adult Roles: Work, Family, and Life (L. Gilbert and J. Rader). 24. Power and Gender: The Double-Edged Sword of Ambivalence (S. Goodwin and S. Fiske). Author is known as a founder of women/feminist psychology and is co-author of the #1 undergraduate text on the psychology of women and gender. Coverage includes the developmental, biological, social, and intrapersonal aspects of women and gender. The handbook includes contributions from international scholars and offers a cross-cultural perspective.